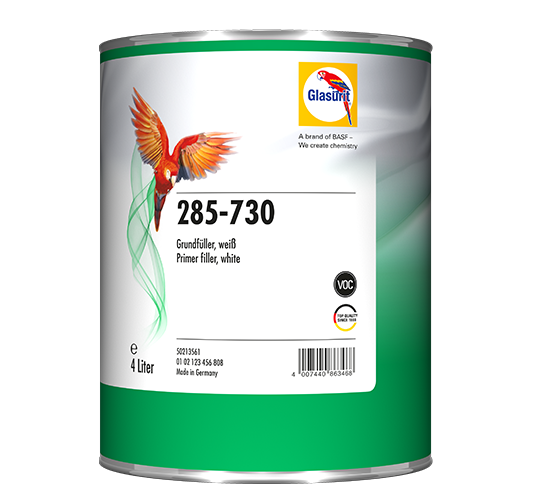 For standard refinishing, Glasurit 285-700 Primer Filler, grey, is an entirely good solution. It stands out for its numerous good qualities: simple, user-friendly application, good filling properties, excellent spraying reliability and the wide range of drying methods that can be used. The 285-700 Primer Filler is suitable for both wet and dry sanding and can be sanded almost effortlessly. This product is part of a product system. For standard refinishing, these primer fillers are an entirely good solution. They stand out for their numerous good qualities: simple, user-friendly application, good filling properties, excellent spraying reliability and the wide range of drying methods that can be used. The primer fillers are suitable for both wet and dry sanding and are easy to sand. As a package solution, Glasurit 285-700 Primer Filler, grey / 285-790 black and 285-730 white are particularly efficient, for the grey shade concept also allows bodyshops to save up to 40% of the basecoat.